I lost count the other day of how many ways I can connect with people and of course how they can connect with me. We have land lines, cell phones, email, texts, pins, actual mail (ask your father), social media or my absolute favorite – in person. I’m sure you’re like me and in a given day you may connect with the same person in many of these ways. It begins with a pin about lunch. You return that with another pin. Then the person calls your cell and leaves you a voice mail. You call back and get their voice mail so try their land line. While you are calling their land line, they are sending you a text. What may have taken a few moments in “the olden days” has suddenly turned in to a confusing game of misinformation and half sentences. All this communication takes place in the interest of organizing a time to grab that sandwich. That’s an easy example. Where it gets tricky is when you get in to that horrible cycle we’ve all been through – the email stream. I try – though often unsuccessfully – to work from the three email rule. If you send me one, I return it, and you return mine, it’s time for an actual phone call. Again, not always possible and doesn’t always work out. As our world continues to shrink, we rely on technology more and more. The toys help streamline our day but often end up messing us up. It takes a master to write emails in the true intent they are meant – we have all written stuff that was misunderstood or taken out of context. We’re so busy being busy that we’re too busy to get anything done. 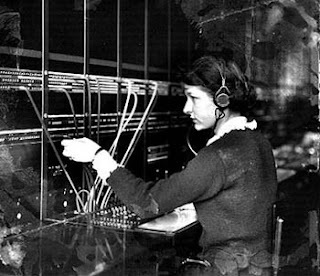 Perhaps we should go back to calling the operator to make a call? Ask your grandfather.